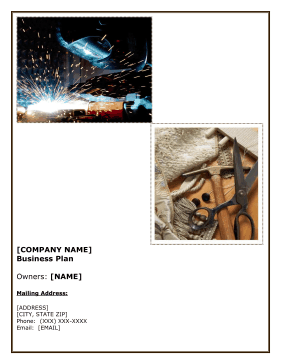 This free, printable business plan helps companies that sell furniture and upholstery to manage, operate and administer the interior design and home decoration business, as well as organize income and capital. The owners of [COMPANY NAME] are [NAME]. The Company is a sole proprietorship start-up. The company operations will be located in [COUNTY], [STATE]. The Company will be constructing a new building on land that will be purchased once grant funding is received. Building construction will be completed using environmentally friendly materials and installing energy efficient equipment. The company operations will consist of welding and upholstery services in accordance with the designs and concepts residential and commercial customers. The company is dedicated to providing the highest quality workmanship, meeting the agreed delivery dates, and executing the custom work exactly in accordance with the designer's concept. The focus of this business plan is to identify its future target clients, explain its marketing strategy, and to improve its internal procedures so it can substantially increase profitability. [COMPANY NAME] will provide welding services on fencing, metal stairs, railings, shutters, and etc. The upholstery end of the business will complete auto restorations, home sofa repair, and auto top repairs. The current financial plan for [COMPANY NAME] is to obtain grant funding in the amount of $250,000. The grant will be used to purchase land, purchase (1) work van and (2) trucks, purchase necessary equipment and office equipment, and cover payroll for 1st year of operations. • Achieve sales revenues of approximately $300,000 by year three. • Achieve a customer mix of 30% commercial/60% residential contracts per year. • Expand operations to include all the [REGION] area and surrounding cities in [STATE]. The mission of [COMPANY NAME] is to serve the community with the best service at a fair price. The Company will be dedicated to providing the highest quality workmanship, meeting the agreed delivery dates, and executing the custom work exactly in accordance with the customers concept. 2. Customer service with a smile. 4. Ensuring the install is the finest product on the market.